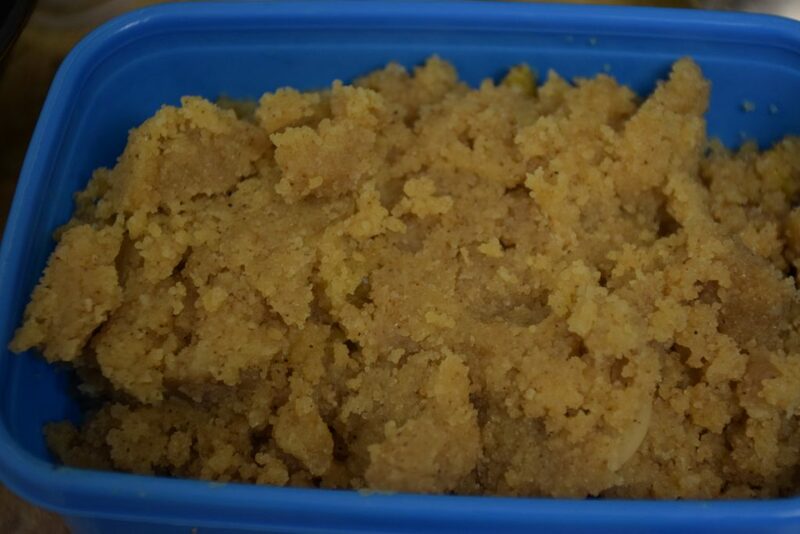 Sooji ka halwa or Sheera (Semolina pudding) is the most basic sweet dish in every Indian household. In our culture, it is prepared by the newly-wed bride as the mark of beginning her kitchen journey. This reminded me of my “pravesh“(entry) in the kitchen. Before this entry, I enjoyed all the delicacies prepared by my mother-in-law like other guests. 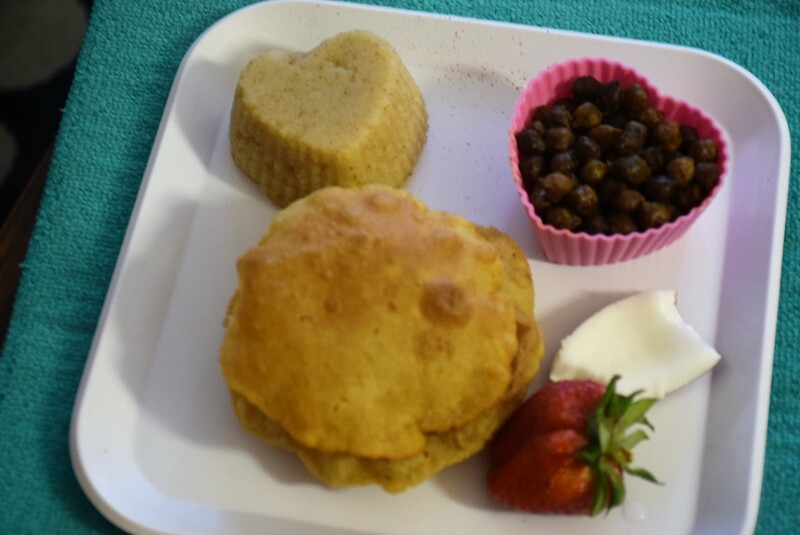 She used to make lip-smacking ,crispy parathas in breakfast with aloo gobhi, aloo curry . After this ritual, the bride gets gifts as a token of appreciation of her “pahali rasoi” (first meal). We, Indians also prepare this on our festivals or on some special occasions like birthdays or anniversaries. It is also offered as a “Prasad“(offertory) to God before serving anyone in the family or guests in some families. 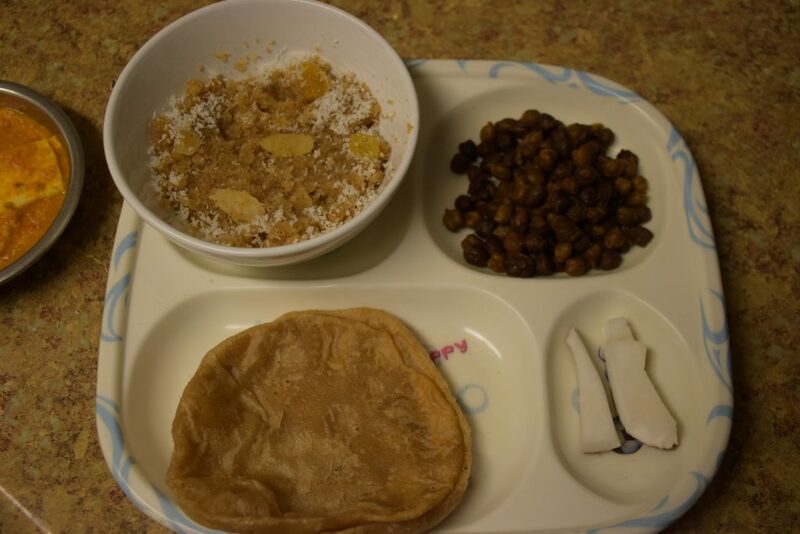 I prepared it recently for “Maa Durga” on Durga Ashtami to feed little kanyas (girls). I made it sans nuts and dry-fruits for the kids. But you may add the choice of your nuts(almonds/cashews/pistachios/chironji/raisins) and some grated coconut to garnish it. Also ,you may add milk with water in the same ratio i.e. 1:1 or 2 parts of milk+2 parts of water for every 1 part of sooji. 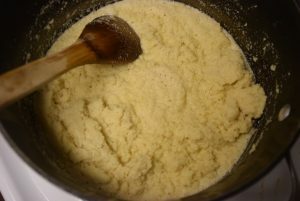 Or you may add only milk in 4 parts to sooji, i.e. 4:1 . 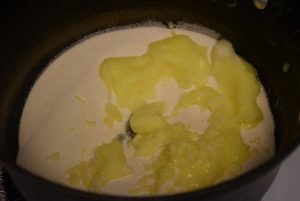 But two things are irreplaceable – sooji and ghee . :D.
1. We start with roasting the sooji in a big Wok(kadhai). We need a big kadhai, so that when we add syrup or water to it, it is easy for us to turn it around in the wok. Add ghee in the wok and let it melt. 2. 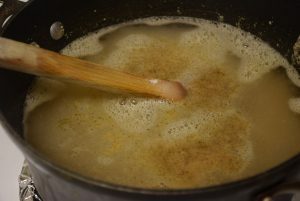 Once it is melted , add the sooji in it at medium heat. 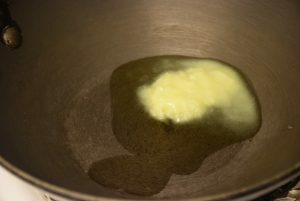 After adding sooji, if you feel the sooji is dry and falling apart, add some more ghee. 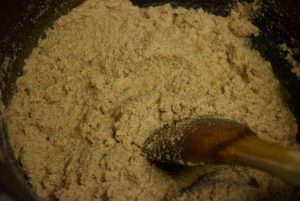 The sooji-ghee mixture should be binding enough to hold them together. 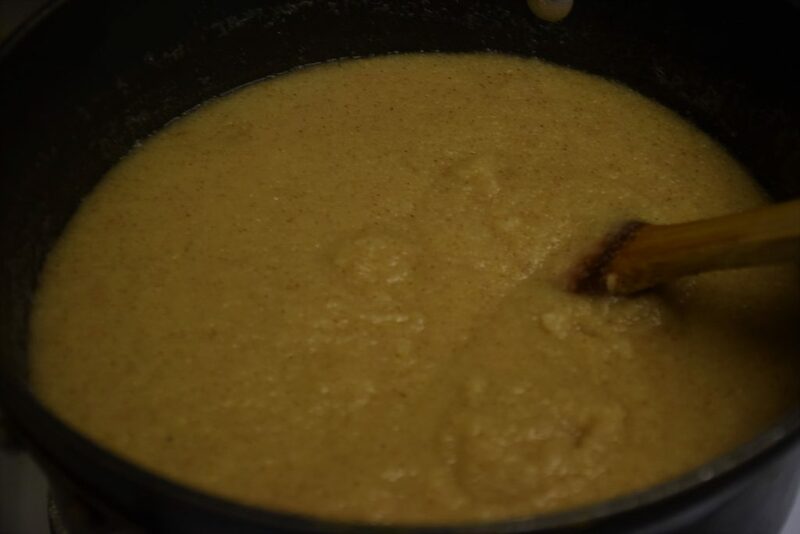 Stir it continuously at low or medium heat to avoid burning of sooji particles at the bottom. 3. When you see the mixture is bubbling, and the color of sooji has changed with some aroma of roasted sooji in air, it is time to add water . 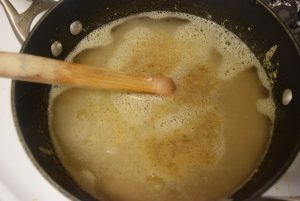 You may prepare syrup beforehand by mixing sugar with water and giving it a quick boil just before adding to the roasted sooji. But be careful, while adding water to the hot roasted sooji. Hence we need a big vessel to avoid sputtering of water and mixture all over the counter. 4. Cover it instanly, once all the water with sugar has been added. Stir it gently a few times to help the water reach the bottom of wok. 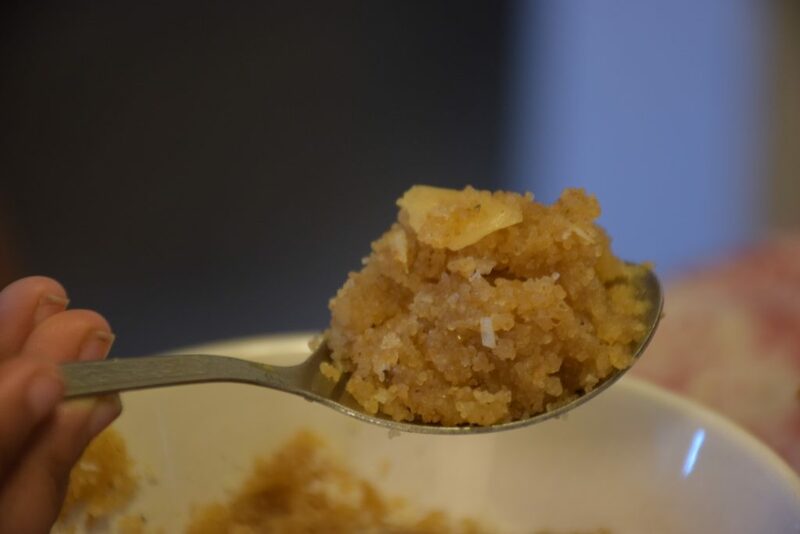 Cook on medium heat till you see a thick paste like consistency of the Halwa. 5. Garnish it with nuts, cardamom powder and dessicated coconut as per your choice. You may add saffron strands too in the end. I, however, kept it plain, to make it kids-friendly. Serve it hot or cold with poori , Dal – rice or with any complementary meal. It can be served as a dessert towards the end too. 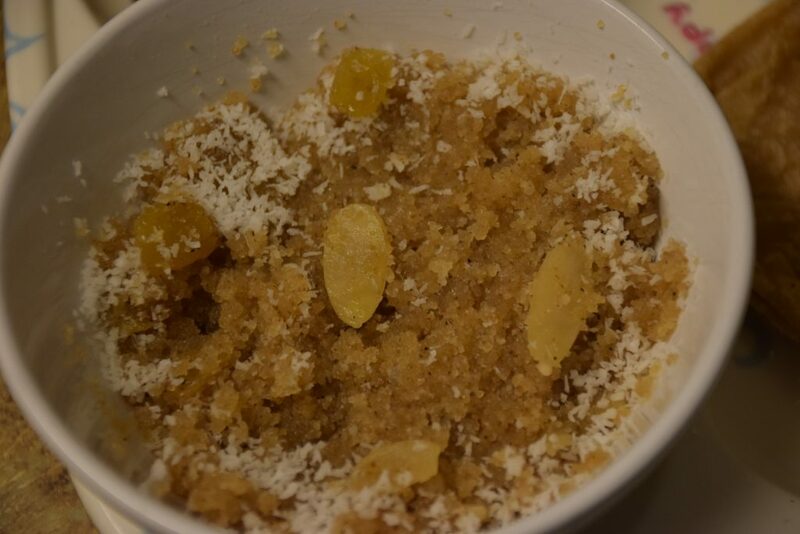 This entry was posted in Appetizers, Desserts, Diwali Delicacies, Food, Kids- Favourite, Recipes, Snacks and tagged almonds, badam, basic, blanched, cardamom, Carenshare, cashews, chironji, clarified butter, desi ghee, dessert, dessicated coconut, Durga Ashtami, Elaichi, ghee, ghee-loaded, Indian pudding, Indian sweet pudding, jaiphal, kaju, Kanchak, kesar, kishmish, melt in mouth, melt--n mouth, milk, milk soaked, nutmeg, pista, raisins, saffron strands, semolina, shweta jindal, silvered, sliced, soft, sooji, sweet, water, zindagisikhati.